Melrose jumped to second place in the Premiership following their win over Selkirk last week helped by Heriot’s losing at Stirling. But those in the Greenyard’s camp are all to well aware of the changing face of top flight rugby on a week to week basis and remain cautious as the second half of the season swings into action. 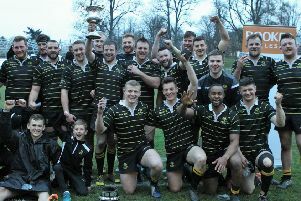 “It’s a very competitive league,” said Melrose director of rugby Mike Dalgetty. This weekend’s visitors to the Greenyards are Hawick, who have pulled off a few surprises also this season. “This will require us to be at our very best as they are playing with confidence and will love the chance to take us on at home,” added Dalgetty. Over at Netherdale George Graham’s men will be looking to kick start their revival although neighbours Selkirk will be equally determined. In the National League Kelso play host to Edinburgh Accies while Jed-Forest and Peebles travel to play GHA and Howe of Fife respectively.